IT’S BEEN A busy year for gaming. While the biggest games of the year have focused on open-world experiences and combined with with improved storytelling, there have been some fantastic games covering different genres from episodic stories to platformers to reboots and revivals. While there are clearly too many to choose from, here are the recommended games you should consider buying. Perhaps one of the best medieval fantasy games released, The Witcher III: Wild Hunt sets the bar for all adventure games out there. You could easily ignore the story and just explore the vast world on offer, one that is packed to the brim with side-quests, points of interest and distractions that are just begging to be discovered. What is likely to be Hideo Kojima’s last game at Konami, the fifth addition to the MGS series is an open-world behemoth that allows you to approach missions in a number of ways. Much like The Witcher III, the production values and the level of attention provided, from the world building to the difficulty to the overall accessibility it provides to both new and regular players means you will be sinking months into it, or berating similar games for not offering the same level of freedom. The only drawback is the multiplayer mode which doesn’t exactly match the high standards the single player game provides. The batmobile’s inclusion may have split opinion and the crippling bugs that plagued the PC version over the summer still live on in the memory, but as far as sendoffs go, this is as good as it gets for the caped crusader. The melee combat is still as satisfying as ever, the open-world structure gives you a great degree of freedom and most importantly, you get to be Batman, a hero whos proves you only need your wits, fighting ability and a limitless bank account to fight crime. As it’s come from the same makers as Dark Souls, Bloodborne is an incredibly unforgiving game. A lapse of concentration is all that’s needed for you to suffer a gruesome death while as you explore the haunting city of Yharnam, which is filled with monsters and Lovecraftian-style monstrosities. Yet persevere and things will click together. Its ‘attack is the best form of defence’ philosophy may seem counter-intuitive but it creates a tense, but thrilling game. Up until the late 2000s, Pro Evo was the undisputed king of football games before FIFA snatched it away from them. Now the competition is tighter than it has been in a while, and it looks like Pro Evo is back on top again. Greater depth, the feel of play is sharper, and both your on- and off-field decisions can have a major impact on how a game plays out. The Chinese Room’s tale about an abandoned English village where all its inhabitants mysteriously disappear doesn’t prioritise action, but what it does have is atmosphere, intrigue and tension as you piece together what happened in Yaughton Valley. It’s a slow-paced game, but it has an emotional core that’s rarely seen in first-person games. One of the biggest hits to arrive this year, think of Rocket League as a cross between indoor soccer and rocket cars that can propel themselves in all directions. The end result is a massively entertaining game that’s as fun to watch as it is to play. The fifth version of the series may have disappointed some, but Forza Motorsports 6 makes up for those to bring you a comprehensive racing game. Hundreds of cars, numerous racing modes for both online and offline players and a fine balance between arcade thrills and simulation makes it one of the best installments in the series. Combining the classic Zelda series with Groundhog Day was one of the stranger decisions Nintendo made, but the N64 classic holds up as well today thanks to a strong concept and some small additions. It’s easily one of the darker games in the Zelda series as you’ve only 72 in-game hours to save the world (which you can reset), but it’s one that fully deserves your love and attention should you own a 3DS. The single-player game is decent, if a little underwhelming, but where Halo 5 shines is in its multiplayer mode where it offers a varied and competitive modes of play. With the ability to rewind time, Maxine Caulfield’s time at Blackwell Academy and the town of Arcadia Bay is a slow-burner, but the episodic nature (there are five of them) works to its advantage. As you get to know the cast and try to figure out the mysteries of your new home, you will find yourself emotionally invested as the plot progresses. It’s flawed but its characterisation and combination of dark and poignant storytelling makes up for it. A charming game where you control a small robot called BUD, you must traverse and climb through a number of floating islands in your search to find a magical plant that will save your home world. The flash game turned full-on platformer is brutal and tough as nails, but the controls are impeccable as your ninja navigates each course. You’ll fail repeatedly, but it’s incredibly satisfying when you do complete the more difficult ones. You like nostalgia, right? Well, Rare Replay offers that by delving into its vast back-catalogue and bringing out 30 games. There are some noticeable exclusions – Goldeneye being one of them – but it’s a solid collection and the inclusion of features like rewind and save is a godsend when you’re trying to complete the likes of Battletoads. A level editor designed to show off the creativity of gamers everywhere or an experiment to create the most maddenly difficult Super Mario level in existence? Whatever the answer, the result is one of the most accessible and creative Nintendo games on the platform. There were many ways this could have went wrong, but the level of attention and detail over the smallest of details shows why Nintendo is still so beloved even today. Xbox has the exclusive console rights to the game for the first year, meaning PS4 owners will have to wait until Christmas 2016 for it to arrive (PC owners only have to wait until early next year). Expanding on the format that served the quite impressive reboot so well, Rise of the Tomb Raider pushes the series forward as you explore the Siberian landscape. Remember just how fun SimCity was back in the day and how recent games lost their way? Well Cities: Skylines takes on the mantle but its attention to detail and its ability to balance both the big and small decisions without overwhelming players makes it an engrossing experience. Just be warned, much like the Football Manager series, it will swallow up your time completely once it gets ahold of you. And that’s before you try out any of the mods for it. One of the finest point-and-click-style adventure games released, Grim Fandango uses the Day of the Dead as its setting for a story that takes inspiration from film-noir. With fiendish puzzles, a large cast, and some genuinely funny moments (Glottis alone makes it worthwhile), it’s an essential purchase for those who didn’t experience the magic back in 1998. A game that is about finding and watching a number of police interviews with the same person isn’t a great prospect, but it’s the setup for what is an intriguing game. As you put in search terms, what starts off as a simple disappearance case turns into so much more. Once you get past the obvious searches, you learn more about the person being interviewed than the murder itself, a fantastic performance that drives the plot’s many twists forward. If there’s a criticism, its that once you’re finished, there’s little to come back to but like a good book, it’s hard to think of anything else until you reach the end. It’s recommended that the less you know about the plot, the better. And have a notepad handy too. 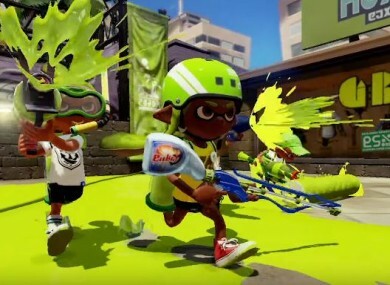 A multiplayer shooter that isn’t about armies or terrorism, Splatoon’s upheaval of the genre’s conventions by placing the focus on paint. With the aim to paint as much of the level in your team’s colour, Splatoon’s cheery visuals and bright-eyed enthusiasm is a welcome change from the dreary and gritty entries that flood the multiplayer shooter genre. Expectation is a tricky thing to live up to and yet Bethesda managed to do it again. The post-apocalyptic shooter brings with it town creation, a revamped combat system, and a greater focus on companions means there’s more changes than a full-on overhaul. Although leaving it till next month might be a wise decision considering how many bugs are experienced in its launch. Waiting it out until Christmas would probably be the wiser decision in this case. Email “These are the best games you can get this year”. Feedback on “These are the best games you can get this year”.